In the 1994 action-thriller Speed, a police officer is tasked with keeping the speed of a bus greater than 50 miles per hour or else he risks detonating an on-board explosive. 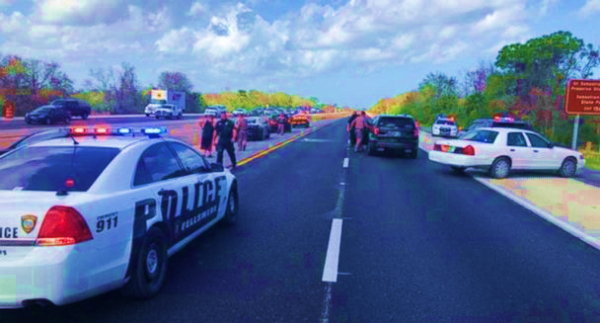 A recent incident on a Florida freeway wasn’t exactly made for Hollywood, but it was arguably just as tense for all of those involved. And while a Florida traffic school can help motorists with ticket dismissals, we don’t know who (if anyone) should get cited for the incident that we’re about to share. You’re driving down I-95 in Vero Beach, a busy Florida freeway, when your gas pedal gets stuck. That’s exactly what happened to Joseph Cooper, who was driving by himself in a BMW SUV at about 1 p.m. on February 13. As you can imagine, Cooper was traveling at a high speed on the highway – up to an estimated 95 miles per hour at times following the stuck pedal – so while it’s never an ideal situation when the gas pedal becomes stuck, you certainly don’t want it to get stuck when you’re driving on the freeway. But how Cooper’s vehicle finally slowed is where this story really gets amazing. In such a circumstance, with an SUV speeding down the freeway unable to slow down, we certainly wouldn’t fault anyone for acting hysterical – perhaps even panicked. But not Cooper. According to the authorities, Cooper remained calm during the ordeal, which likely led to the outcome that it did. After he realized the gas pedal was stuck, Cooper dialed 911, which then walked him through some steps to try to stop the vehicle. After none of the steps panned out, officers realized that they needed to take action to prevent Cooper – and other motorists – from being injured. After Cooper was unable to stop his vehicle by means of putting it in neutral and other matters, police needed to intervene to ensure a safe outcome. They took to I-95 and directed traffic away from Cooper’s vehicle. Then, they made attempts to slow his vehicle by throwing stop sticks into the road to deflate tires. The first batch of stop sticks took out two tires, which slowed Cooper’s car to about 60 miles per hour. Another round of stop sticks took out the other two tires, to the point where the vehicle was literally rolling along on its rims. The only problem was that it was still traveling along at 40 miles per hour. However, it wasn’t long before the SUV slowed to a crawl and eventually to a stop. Cooper, still cool and calm, immediately emerged from the vehicle. Despite a great deal of potential for injury, miraculously, nobody was hurt. All told, Cooper’s runaway SUV traveled about 40 miles down I-95, which makes the absence of injury even more miraculous. So, what happened? That’s a good question. BMW called the incident “implausible” and indicated that Cooper should have been able to stop the vehicle in several ways. But that doesn’t appear to have been the case. So, was it an odd manufacturing defect? Some sort of user error? Something else? The matter is currently under investigation, and we’ll hopefully soon know the answer. For now, however, it’s important to give proper credit to the local authorities and to Cooper for staying poised when danger struck to ensure a safe outcome for everyone involved. Things obviously could have been much, much worse. Stay tuned as more information becomes available on this story in the coming days.